Tungsten alloy rod added Mo(WMoNiFe), similar to one type of famous brand rod, is a tungsten-based material made through special high temperature powder metallurgy techniques. This kind of WMoNiFe material has a low coefficient of thermal expansion, good thermal conductivity and excellent properties at elevated temperatures. Tungsten alloy rod added mo(WMoNiFe) can be used as welding rod due to its high melting point and low coefficient of thermal expansion. Elements added to tungsten alloy rod can enhance machinability, ductility and welding properties. Material properties are very important for tungsten alloy rod added mo to be much proper while associating other tool materials by heat treatment. Tungsten alloy rod added mo is used in electrobrazing applications where heat balance is important. The tungsten alloy rod added mo(WMoNiFe) is similar to one type of famous brand rod with good anti-sticking qualities, high temperature abrasion and hardness properties. The oxidation resistance of both tungsten alloy rod is excellent up to 1100oF. WMoNiFe is used as a base due to its high melting point and low coefficient of thermal expansion. 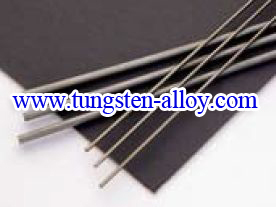 These properties of tungsten alloy rod added mo result in less thermal cracking and soldering with the die cast or extruded material while welding. Elements of tungsten alloy rod added as WMoNiFe imporve its machinability, ductility and welding properties. The good thermal conductivity provides additional benefits to increase cooling to cool areas and potentially increases production rates. Material properties ensure tungsten alloy rod added mo easiler to be associated with heat treatment of other tool materials. Tungsten alloy rod added mo can be finished as per customized shape and size. Material is in rough oversize to be finished as round bars rages from 3/16 inch to 4inch dia. x 12inch long. Rectangular bars and finished tungsten alloy rod added mo can be readily manufactured to specifications. The high density of tungsten alloy rod (WMoNiFe) shrinks considerably during sintering. Depending upon design of tungsten alloy rod added mo and configuration, parts may be pressed and sintered close to final size and configuration to minimize machining costs. 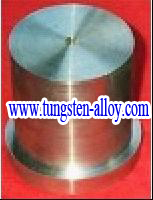 Special shapes of tungsten alloy can often be pressed in the die and sintered to near net shape. If you want to know more details about tungsten alloy rod added mo, please feel free to contact us by email: sales@chinatungsten.com or by phone: 0086 592 5129696.